Television documentary, 2013; duration: 28 minutes; narration: Ramona Koval. The film essay, and now more recently, the video essay, have virtually become axiomatic in contemporary art, film and video. And yet, in certain quarters in the art establishment these are two forms that still elicit controversy. You only have to go to this as recently as the 2014 Turner Prize, which was awarded to the Irish-born artist Duncan Campbell for his work It for Others, to appreciate how the essay audio-visual form (in its various multiplying generic expressions) still creates aesthetic and cultural static. This is incredible given how its lineage can be clearly traced back to the historical avant-garde, film modernism, documentary cinema, photojournalism, radio, and as we know, if we are tracing its arc back to its literary essay origins back then we need to go the seminal French author and traveller Michel Montaigne and even before him. But what I intend to do in this article is to speculatively discuss a recent example of the form by the bold imaginative Australian independent filmmaker John Hughes, whose exemplary oeuvre stands out in contemporary Australian documentary film-making. I am referring to his little known, extraordinarily crafted and compelling archive film essay about the not so well-known love affair between two of this country’s major creative and public intellectuals, the poet and activist Judith Wright and the cultural policy mandarin and economist “Nugget” Coombs, aptly titled Love & Fury (2013). Their clandestine love for each other lasted over 25 years and it symbolically represents in many complex ways and nuances the intricate ethical, creative, historical, and political vicissitudes of how our past literary, civic and public life are elaborately intertwined shaping our post-colonial global and national horizons. And also, as in the case of Wright and Coombs, the shared adventure of letting go of one’s cultural cringe yoke in creating a republic on ‘our fatal shores’. (Robert Hughes). What we see and hear, time and again, in this poignant and resonant television documentary, which was shown on ABC television quiet awhile back, through their mutual love for this country and its first people, which stamps every archival frame of this indispensable film, is their courageous, profound and poetic understanding of what it means to accept and value our country and its first descendants in our emerging turbulent world of neoliberal late capitalism, (post) colonialism and climate change. Make no mistake about it: both Wright and Coombs were fiercely dedicated and lyrical eco-warriors foreshadowing our present day Anthropocene era. In many significant ways, the underlying existential and political theme of Hughes’ film critiques our public and private lives, both in the past and in the present. It is a devastating examination of how conservative, repressive and ‘life-dimming’ (Manning Clark) our past history has been. And if Wright and Coombs were alive today they would be, one would imagine, vocal critics of Tony Abbott’s past and Malcolm Turnbull’s recent ruinous political stewardship of this country. Our asylum seekers policy of the last 20 years or so, clearly reeks of stubborn draconian cruelty, and the ever-lingering remnants of our past “White Australia” policy would be an anathema to our two subjects. Also, it pays us to remember that this film was seen on the ABC, our unique national broadcaster, whose future now appears unfortunately threatened by the encircling jackals of rampant free-market ideology. Including, of course, judging by our recent Federal Budget, a certain group of right-wing ideologues of the Coalition Government and the dreaded Pauline Hanson (One Nation Party). Raymond Gaita, in a timely and perceptive essay on Simone Weil, the French philosopher and her posthumously published tract The Need for Roots (1949 [1952 in English]), and our appalling government’s policy on asylum seekers, makes the forceful point that we as artists and citizens need to re-examine the heroic and grandeur character and limits of such concepts as dignity and human rights in order to ethically hear the silent cry of the afflicted globalized asylum seekers and the dispossessed. (1) Furthermore, Gaita deploys Weil’s sharply nuanced ideas of being rooted in one’s national culture as a basic form of existential and spiritual nourishment and country as ‘a vital medium.’ (2) Two vital concepts that have importantly coloured the shared beliefs and actions of Wright and Coombs in their tireless polemical endeavours to leave this world a better place to live in. In fact, Hughes’ film reminds the viewer that all of us, living in this globalised world of ours, are obliged to ensure that our ethical, cultural and theoretical ideas and perspectives on ourselves and our institutions, values and priorities at this historical juncture, more than ever before, are tested through our individual and collective dangerously expanding carbon footprint on earth. In other words, our geological imagination and understanding of how late capitalism, climate change, power, space, time and technology are so intricately braided with each other by the day are so compellingly urgent to acknowledge. Before we turn our attention to Hughes’s documentary in some detail, it would be appropriate at this stage, to speak a little about Hughes’ own biographical context, as one of our more imaginative, experimental documentary filmmakers whose own aesthetic, artistic, cultural and historical roots and traditions as an independent film-maker is primarily Australian in orientation, relating to art, cultural politics and history. His prolific oeuvre, over the years, as a writer-director, include documentaries dealing with various aspects of Australian race relations, film, history and indigenous rights such as After Mabo (1997), River of Dreams (2000), and “micro docs” such as Howard’s History (2004) and Howard’s Blemish (2004), amongst many other sponsored and independent films. There are films dealing with the Australian labor movement such as Film-Work (1981) and the widely-acclaimed hybrid work Traps (1986), amongst many others. Other films later are concerned with the early Cold War including the already cited Film-Work and The Archive Project (2006), and Indonesia Calling: Joris Ivens in Australia (2009). Between 1998 and 2008 Hughes collaborated with Betty Churcher to produce a marvellous series of popular arts television programs including “micro docs” like Hidden Treasures (Film Australia/ABC TV Arts, 2007) and in the following year An Unstoppable Force: John Olsen with Betty Churcher (Film Australia/ABC TV Arts, 2008). Hughes has also made a number of other acclaimed major films, installations/video art and Super-8 films during the last 30 years that include a cinema feature What I Have Written (1996), All That Is Solid (1988), One Way Street: Fragments for Walter Benjamin (1992), and installations like November Eleven (1979), Works in Progress (1981), On Sacred Land (1984) and The Archive Project, ACMI version (2006). Love & Fury, as a television documentary, recording the complex context and features of the illicit love affair and correspondence of Judith Wright and “Nugget” Coombs allows for them to express and speak for themselves in such poignant, resonant and intricate ways. Wright, not only one of Australia’s greatest lyric poets whose interest resided in the individual’s position in the world at large and not as nature per se, spoke of the feminine experience at the heart of her poems. But as the years progressed, Wright’s widely acclaimed poetry became a secondary concern to her as a disciplined fiction writer immersed in the history of her ancestral pastoral forebears and their pioneering role in the cultivation of agriculture for the New England district of NSW. Consequently as a result, she became very acutely concerned with the displacement of the original people of this country, the progressive ecological despoliation and in general, her eco-activism initially focused on her abiding love for this country and related environmental issues, but with her relationship with “Nugget” Coombs, the Keynesian intellectual, policy mandarin for both Labor and Liberal Governments and the first governor of the Reserve Bank, she became very attracted to Coombs’ long-standing passion for indigenous rights. Wright’s direct activism is profoundly spelled out in her letters to Coombs with such a sober, fierce ethical imperative that emerged arguably out of her earlier White Settler’s sense of guilt relating to how the wealth of her ancestral forebears and family was predicated substantially on how it was built on the original owners of the land. Wright comes across, in contrast to Coombs’ more gentle romantic persona, as someone who is more self-disciplined, an eco-warrior, and more pragmatic in concentrating on changing her world. 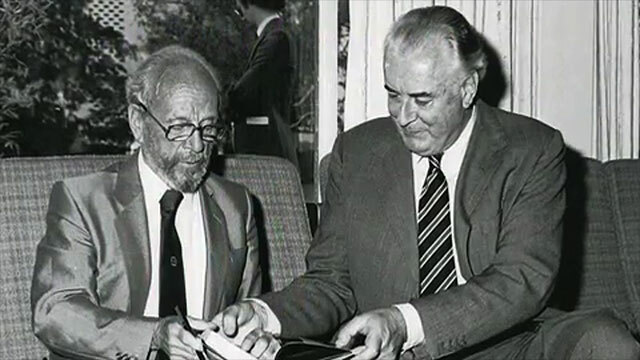 Central to Wright’s and Coombs’ love affair are the Whitlam years in that it started in the first year of Whitlam’s Labor government and with the dismissal of Whitlam Wright became vociferously scathing of the reactionary conservative forces responsible for it. As Coombs’ health became an urgent issue – all those winters in Canberra brought upon Coombs’ pneumonia – Wright moved from her Tamborine Mountain residence to Canberra to be closer to him in 1975/76 when he was a visiting Fellow concerned with indigenous issues at the Australian National University. 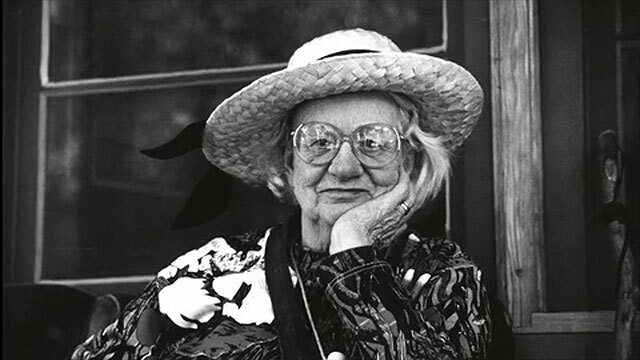 There is splendid archival footage of Wright living near Braidwood in NSW and walking in the surrounds of her place. However, with the regular bouts of pneumonia that Coombs experienced he decided to move to Darwin six months a year to pursue his deep interests in indigenous justice and land rights. 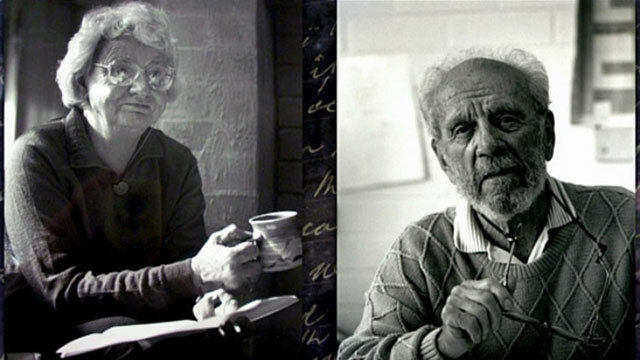 The relationship and correspondence of Wright and Coombs became, over the years, quite complex and urgent in their shared demanding trajectory to engage in environmental, indigenous and cultural issues salient to their common vision of Australia shedding her colonial monarchist ties to England. However, Wright believed that their activist activities were too profoundly important to be negated by the surrounding negative political forces and consequently Wright became more guarded and self-censorious about their relationship and correspondence. 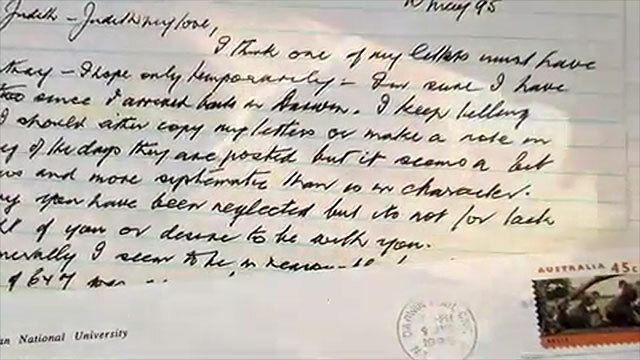 Indeed, Wright with her increasing sense of isolation and loss of hearing, etc., burned a fair amount of the early letters between them. Much to Coombs’ consternation. Love & Fury contains numerous archival clips of Wright and Coombs together in Kakadu National Park, Northern Territory, and elsewhere, vast panoramas of the Outback, its flora and fauna, Aboriginal rock paintings, and the moving iconic image of Gough Whitlam pouring red dirt through Vincent Lingiari’s fingers (this was Coombs’ own suggestion) to the soundtrack of Paul Kelly’s powerful anthem song for indigenous justice “From Little Things Big Things Grow”, etc. Also, we encounter several times Helen Morse and Paul English in a studio reading out the letters with subtle restraint and poise. From the very opening of Love & Fury, where we meet Wright’s daughter Meredith McKinney recounting the time that Wright and Coombs visited Kakadu National Park and the two became separated from each in the solitary landscape and McKinney humorously offers the suggestion that she became terrified at the prospect of losing two national treasures in the one day, to Nonie Sharp who was appointed by McKinney to read and write about their correspondence, recounts the time that both Wright and Coombs wanted to avoid being conspicuous at Uluru and decided to drive around in the desert in a Red Moke car, to Tim Rowse, Coombs’ biographer, detailing some of the major policy milestones in Coombs’ own career, to Fiona Capp and John Hawke respectively talking about Wright’s poetic impulse, pastoral ancestry and her legacy to Australian literature, the film is quite bold in its overall thematic and formal endeavour to honestly delineate the many biographical, cultural and political complexities and issues that the famous couple encountered over the years. 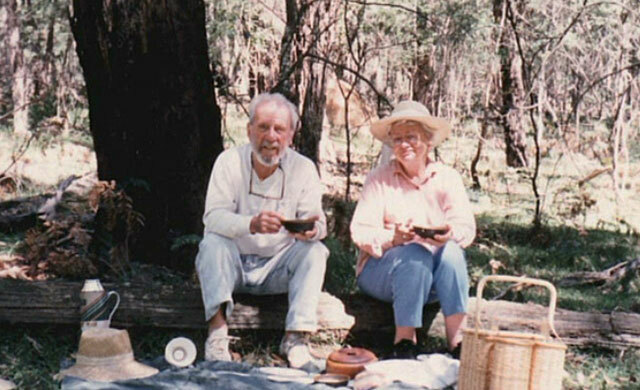 As an archival essay documentary, Love & Fury is quite an engaging and significant film that explores the intellectual, cultural and emotional aspects of the Judith Wright and “Nugget” Coombs’ relationship and correspondence and in terms of John Hughes’ prolific independent film oeuvre it should be singled out as one of his more accomplished television documentaries. Regrettably, it has somehow been overlooked by many, apart from those who have a specific interest in his experimental independent cinema. This is a pity as it merits our critical attention, and although it is not by far Hughes’ boldest creative effort (and many are bold indeed), Love & Fury has a special importance as a television documentary that deals with a relatively little known subject, the Wright-Coombs relationship, etc., and in that critical context it is a film that is quite refreshingly respectful of its tremendously private and public emotional character. John Conomos is an artist, writer and critic and is a fellow at the VCA, University of Melbourne and has just finished his personal documentary about his mother The Girl From the Sea (2018).